By the end of The East I’m not entirely sure who the bad guys are. I can’t even say for certain it’s not me – and I’m pretty sure that you could be one of them too. This is the effect of The East – a claustrophobic, morally ambiguous thriller in which no one is "the bad guy" per se. Or would it be more appropriate to suggest that everyone is? It's a movie in which no one comes up smelling of roses - no one is righteous, although everyone believes they are. As they say - one man's terrorist is another's freedom fighter. Equally one man's terrorist in another's Leader of Big Business. Brit Marling stars (in a movie she also co-wrote) as an operative working for a private intelligence firm who plans to inveigle her way into the inner sanctum of an eco-terrorist group known as "The East"; from here she'll feed back information of their planned activities to her employees' corporate clients. Proving her dedication to the cause, Moss (Marling) finds herself living in a large squatted community with a gang of idealistic counter-culture freegans who have dedicated their life to righting the wrongs big business inflict on society. To say they are a humourless bunch is an understatement - they are pious, ideological and driven in equal fashion. "Why is it," Moss wonders "that self-righteousness always goes hand-in-hand with resistance movements?" anti-authoritarian tech-savvy crew have some big plans in store which includes mass murder - this, they reason, is simply eye for an eye as multiple malpractices from corporations have led to the direct deaths of many innocent victims. Moss finds herself in an uncomfortable scenario - if she tries to stop The East, her cover will be blown. Simultaneously, having lived amongst this patched together crew of outsiders, led by the charismatic Benji (Alexander Skarsgård) and dogmatic lieutenant Izzy (Ellen Page), Moss begins to feel that maybe her sympathies and empathies have begun to wander. 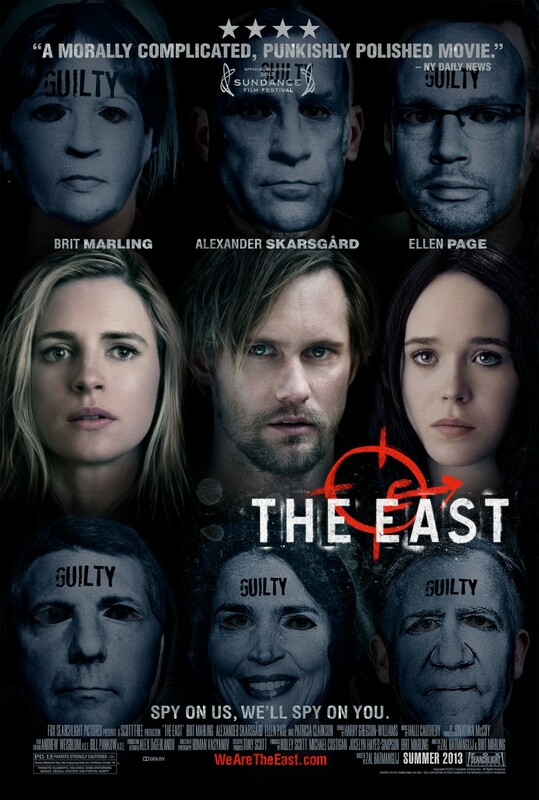 It's a neat, tense thriller where thrills alone aren't the sole end goal - The East is a smart movie which requires the audience to think and make snap judgements. Can we truly empathise with terrorists? They are, after all, human and have been wronged by the capitalist society into which they have been born - surely, an eye for an eye doesn't sound unreasonable? Only, of course, it does. Perversely, it's this humanism, rather than broad stroke caricatures of "evil", which gives the movie it's emotional and political heart. Like Sarah, we find ourselves lost between two very distinct realities and, in this middle ground, we're not sure who is right. Sure, The East's reign of terror is wrong but if they don't hold the child poisoning capitalist to account who will? The free market will leave them alone as long as profits are high and conscience doesn't seem to be a factor which has blighted them at all. The East is provocative but in a non-polemic way - I would be surprised if this didn't rank as one of the smartest films to make it to a multiplex this year There are no answers here (the default position of some of the most dumb and brash ideology driven pictures of recent times), and it's refreshing to feel intellectually energised when leaving an American thriller - having a debate played out in fictional form is a rare and refreshing experience. This sounds really interesting and like a film I might actually enjoy - which is rare for me as I just don't have the attention span! I do like things that make you think and question your views, though. Great review Kieron!